Today’s Friday sermon was about a few incidents in the life of the Promised Messiah (on whom be peace) as explained by Hazrat Musleh Maud (may Allah be pleased with him) highlighting various perspectives of the blessed life of the Promised Messiah. [During second Khilafat e Ahmadiyya] Fierce opponents of the Jama’at held a rally in Qadian in which they were extremely abusive towards the Promised Messiah (on whom be peace). Their ploy was to create disorder and with the grace of God they were not successful in this. However they uttered abuse. Later, Hazrat Musleh Maud (may Allah be pleased with him) spoke at a meeting where he responded to the objections that had been raised and also gave proofs of the truthfulness of the Promised Messiah (on whom be peace). Below is a small part of what he alluded to in the speech he made. The Promised Messiah (on whom be peace) repeatedly asked the Sikhs, Hindus and Muslims of his time if they could raise any objection on his past life. Indeed everyone was witness to his past life being pure or at least no one could raise objection about it. Even a fierce opponent like Maulawi Muhammad Hussain Batalvi had testified to the Promised Messiah’s purity in his magazine and others said that he was pious. How could a person who had been pure for forty years become foul overnight? Expert psychologists opine that moral ills seep in gradually and moral deterioration does not take place all of a sudden. God states: ‘Most surely We help Our Messengers…’ (40:52). Hazrat Musleh Maud (may Allah be pleased with him) says that all sorts of efforts were made to kill the Promised Messiah (on whom be peace). False court cases were filed against him one of them was a false case of attempted murder of Martyn Clark. The magistrate of this case was determined that he would get the person who had claimed to be the Messiah and who no one else had been able to get. Ultimately, the very same magistrate ended up repeatedly saying that the court case was false and the entire case was dismissed. Maulawi Umer Din Sahib, an Ahmadi missionary who became an Ahmadi after ascertaining the very standard of truthfulness related that he and others were discussing how to oppose the Promised Messiah (on whom be peace). One said that Mirza Sahib had announced that he would not debate anymore; we should give an invitation to debate. If he agrees we can say he had lied when he said he would not debate and if he does not agree we can create a noise that he had lost. Maulawi Umer Din suggested he would go and murder the Promised Messiah. Maulawi Muhammad Hussain Batalvi told him, young man, all this has already been tried. This put the thought in Maulawi Umer Din’s heart that someone who is being safeguarded by God in this way could only be from God. He took Bai’at. Later he met Maulawi Muhammad Hussain near Batala train station who asked him what he was doing there. When he told him that he had been to Qadian to take Bai’at Maulawi Muhammad Hussain expressed his displeasure but Maulawi Umer Din replied, Maulawi Sahib this only happened through you. In Dr Martyn Calrk court case Maulawi Muhammad Hussain appeared as a witness against the Promised Messiah (on whom be peace). Martyn Clark claimed in court that Mirza Sahib had sent a man to murder him. Muslims supported him and Maulawi Muhammad Hussain came as witness. God had foretold the Promised Messiah (on whom be peace) that Maulawi Muhammad Hussain would be there but he would be disgraced. In spite of the revelation about disgrace of Maulawi Muhammad Hussain when it was suggested to the Promised Messiah (on whom be peace) by his counsel that the Maulawi should be asked a certain question which would humiliate him, the Promised Messiah (on whom be peace) did not allow the question to be asked. Questions are put to people in court cases to determine facts and when the Promised Messiah’s counsel read out a list of questions to him that they wanted to ask the Maulawi Sahib, the Promised Messiah (on whom be peace) remarked that he would not tolerate certain kind of questioning. He was told it was in his interest to put that question and it would weaken the opposition case but the Promised Messiah did not allow the question. The Promised Messiah’s counsel, Fazal Din was prejudiced in religious terms but he would always stand up for the Promised Messiah as far as his person was concerned and always maintained that his morals were most excellent and no Maulawi could ever match him in this regard. On the one hand the Promised Messiah (on whom be peace) had received a revelation about the witness being disgraced and on the other hand he did not allow a compromising question to be asked of the witness. God let his high morals be demonstrated and enhanced his honour and also facilitated extraordinary means to humiliate Maulawi Muhammad Hussain. When the magistrate who was a deputy commissioner saw the Promised Messiah’s face he had a change of heart and although the Promised Messiah (on whom be peace) was appearing as a defendant, the deputy commissioner offered him a chair. Meanwhile, Maulawi Muhammad Hussain arrived to observe (God forbid) the Promised Messiah’s disgrace, but was incensed when instead he saw him sitting on a chair. He demanded that he was from a respected family and demanded that he should also be offered a chair. He said he was always offered a chair when he went to see the governor. The deputy commissioner responded even a sweeper is offered a chair when he goes to meet someone but this was a court. He told Maulawi Muhammad Hussain that the Promised Messiah was from a noble family. It was quite extraordinary for Captain Douglas, the English deputy commissioner to have change of heart after seeing the Promised Messiah’s (on whom be peace) face. Captain Douglas’ opposition was not ordinary opposition; in fact it had religious overtones. A few days prior to the day in court he had said that a man from Qadian had claimed to be the Messiah and had insulted their God and he had wondered why no one had apprehended him. He had wanted to issue a warrant against the Promised Messiah but was advised that a warrant could not be issued for this court case and instead it had to be a court summon. Thus a court summon was sent to the Promised Messiah (on whom be peace). When the Promised Messiah (on whom be peace) arrived at court on the appointed day, the very same deputy commissioner who had maintained that he had insulted Jesus Christ, honoured the Promised Messiah (on whom be peace) and told him that he may remain seated when answering his questions. A huge crowd had gathered outside the court. When Maulawi Muhammad Hussain arrived and saw the Promised Messiah (on whom be peace) sitting in a chair he was livid because he had come with the assumption to see the Promised Messiah in hand-cuffs. This was a court presided by an English deputy commissioner in which the plaintiff was also an English priest, Dr Martyn Clark. Dr Clark is widely known to be English although he was the progeny of a Pathan who had married an English person. A scholar like Maulawi Muhammad Hussain appeared as witness at this case yet the Promised Messiah’s enemies failed and were disgraced. As mentioned earlier Maulawi Muhammad Hussain also asked to be given a chair at the court but was refused by the deputy commissioner. Maulawi Muhammad Hussain started arguing which angered the deputy commissioner and he told him to go and stand at the back of the room where all the shoes were. The peon held Maulawi Muhammad Hussain by the arm and took him to where the shoes were. Maulawi Muhammad Hussain felt people outside could see his disgraced position. He saw a chair in the veranda and decided to slip out to the veranda and sit on the chair there. When the peon saw this he thought the deputy commissioner may disapprove so he asked him to leave the chair. Maulawi Muhammad Hussain came outside where people had gathered and some sat on sheets of cloth they had brought with them. He saw some space on one of the sheets and sat down. When the person whose sheet it was saw him there he asked him to get off his sheet saying he had fouled it by sitting on it. He censured him saying he was a Maulawi but had come to support a Christian. Thus, he was disgraced everywhere, both inside and outside the court. These are ‘…manifest Signs…’ (2:100) of God. How He had the Promised Messiah (on whom be peace) acquitted by an enemy and also showed other signs to Captain Douglas which he remembered till his last days. During his 1924 tour of England Hazrat Musleh Maud (may Allah be pleased with him) met Captain Douglas. The head clerk of Captain Douglas at the time of the court case has related that soon after attending court on the day Captain Douglas asked his head clerk to promptly arrange for his train travel to Gurdaspur. Captain Douglas paced the road and looked agitated. The head clerk asked him to take a seat in the waiting room but he wanted to be left alone and said he did not feel well. He said ever since he saw Mirza Sahib’s face he felt as if an angel gestured to him and said he was sinless and blameless, so he adjourned the court. He said there too when he paced the road and reached one end he saw Mirza Sahib’s face saying he had not done anything and it was all a lie. When he walked in the other direction and reached the other end again, he saw Mirza Sahib’s face saying he had not done anything and it was all a lie. Captain Douglas said he felt he would go insane if the situation persisted. His head clerk advised him to go to the waiting room and suggested that the superintendent police was also around. Captain Douglas called for him and told him how he felt. The superintendent said that it was Captain Douglas’ own fault as he had entrusted the main witness to the priests who indoctrinated him and his statements were based on whatever they taught him. The superintendent suggested that the main witness Abdul Hameed should be turned over to the police and it should then be seen what kind of statement he gave. Captain Douglas issued the necessary orders and Abdul Hameed was handed over to the police. At first he stuck to his story and said Mirza Sahib had sent him to murder Dr Martyn Clerk but later admitted that he had been telling lies. The superintendent realised that Abdul Hameed was afraid of the priests so he told him that he would stay imprisoned and would not return to the priests. This is when he confessed the truth. He told that when the priests coached him to give statement based on their concocted story he would say to them that he would forget names etc. so they wrote the relevant information on his hands in coal. Each time he came to give statement he would look at his hand to say the names of such and such where Mirza Sahib had supposedly sent him. Captain Douglas acquitted the Promised Messiah (on whom be peace) at the next hearing. All these were manifest Signs and Captain Douglas was shown additional manifest Signs when pacing the road he would see the Promised Messiah on both ends of the road telling him that he was innocent. Captain Douglas related to Hazrat Musleh Maud (may Allah be pleased with him) that once he was entertaining an Indian at his home who asked him to narrate some extraordinary experiences of his life and Captain Douglas related the incident about the Promised Messiah. Just then the butler told Captain Douglas that someone wished to see him. When the person was shown in Captain Douglas asked, young man who are you? The young man replied you know my father, priest Warris Din. Captain Douglas said yes, I was just mentioning him. The young man said I have just received a telegram that he has died. Warris Din was the priest who had started the concocted proceedings in order to please Dr Martyn Clark and had filed the case. However, God unfolded the truth to the deputy commissioner and the main witness also confessed. However, for Warris Din’s son to arrive at Captain Douglas’s place at the exactly moment he was relating the incident was an amazing coincidence. Captain Douglas related this to Hazrat Musleh Maud (may Allah be pleased with him) and till he died he related it to every Ahmadi he met. Hazrat Musleh Maud (may Allah be pleased with him) says that when he toured England in 1924 Captain Douglas was in good health. However, when the Captain was invited on his second visit in 1953 he sent his apologies saying he was old and infirm and had mobility difficulties. Hazrat Musleh Maud (may Allah be pleased with him) regretted that a motor car was at their disposal and they could have sent for Captain Douglas or gone to see him in 1953. He passed away a short while later. These are indeed manifest Signs through which God demonstrates the truthfulness of His Messengers. A believer should try and become a true believer and God certainly bring about situations which refresh one’s faith when one sincerely tries to be a true believer and in fact there is no pleasure without a faith like this. Of what point is faith which does not open one’s eyes and keeps one in the dark? A person who has no insight in this world has no insight in the Hereafter. One who does not experience manifest Signs in this world will also not experience them in the Hereafter. This sequence of signs continues to this day. The aforementioned incident took place more than a hundred years ago. The sign is now appearing again in that a maternal grandson of Captain Douglas has sent a message that he wishes to take Bai’at. He wonders what good his maternal grandfather did that has intensely inspired him today. We have of course heard the story of the great grandson of Dr Martyn Clark who openly said that his great grandfather was in the wrong and the Promised Messiah (on whom be peace) was truthful. Hazrat Musleh Maud (may Allah be pleased with him) says a true believer should always remain engaged in prayer and remembrance of God to see that day when God unfolds the truth of Islam and His own Being to him and he sees the illuminated face of the Holy Prophet (peace and blessings of Allah be on him) and the luminous Countenance of God. When a person experiences this then days and nights and years can be happy or adverse, they are the same for him. No matter what happens such a person is always happy and content and does not fear anyone. During the court case of Karam Din against the Promised Messiah (on whom be peace) which was presided by a Hindu magistrate the Aryas incited him to definitely penalise the Promised Messiah and he promised to do so. Ahmadis were gravely concerned at this and advised the Promised Messiah (on whom be peace) to somehow go to Qadian where he would be safe. The Promised Messiah replied that he could not be entirely safe in Qadian either for a warrant could be issued for him if he was in Qadian or indeed anywhere else. The Promised Messiah (on whom be peace) said who can lay a hand on God’s lion! The court case was presented before two magistrates and they both had their comeuppance; one of them was suspended and the other’s son became mentally ill and killed himself by jumping from roof top. When man becomes God’s everything in the world becomes his. Just as it was revealed to the Promised Messiah (on whom be peace) in Punjabi language: جے تُوں میرا ہو رہیں سب جگ تیرا ہوِ ‘If you will be devoted to Me, the whole world will be yours.’[Tadhkirah, p. 609, 2009 edition] Nothing in the world will be able to harm you. Be devoted to God and pray that you remain so. This will bring you peace and your children, friends and family will also be in peace. It should be remembered that unless the Jama’at is in peace, its individuals cannot be in peace and the Jama’at is in peace when your next generation is also in peace. Hazrat Musleh Maud (may Allah be pleased with him) recalls the days of Dr Martyn Clark court case. He was troubled and prayed and saw a dream. He saw that he comes home from school and tries to come inside his house but finds a lot uniformed police there. One of them stops him from entering his house but another says he is from the family and should be let in. He then sees a cellar/basement of his house which his grandfather had built. He sees the Promised Messiah (on whom be peace) standing in the cellar which the police has packed with animal dung fuel and some policemen are throwing oil on the dung to set it alight. Hazrat Musleh Maud tries to extinguish the fire but the policemen catch him and physically restrain him. Just then he sees the following written in bold and beautiful writing: Who can set fire to God’s beloved people! There is security and peace for true believers in this world as well as the Hereafter. Hazrat Musleh Maud (may Allah be pleased with him) says he experienced scores of incidents in the life time of the Promised Messiah when he had no power but God facilitated his safeguard. Captain Douglas had said he was perturbed that the court case was false so he reached a decision and truth was proven. Later he said that he had not seen anyone as tolerant as the Promised Messiah (on whom be peace) when he informed him that he could file a counter case of contempt but the Promised Messiah declined. There was a time when Ahmadis were not allowed to go to mosque in Qadian, the mosque door was shut and stakes were put in the ground so that those going to the mosque may fall over in the dark and Ahmadis were banned from going to the water well. Where had all those people gone! Their children became Ahmadi and children of those who worked at erasing Ahmadiyyat are now actively spreading it. The Promised Messiah (on whom be peace) once related a dream of his in which Qadian had spread up to River Beas and was also populated far towards the north. Whereas there was a time there were only eight or ten Ahmadi houses there of underprivileged families. Others came as guests. But now Qadian has flourished. Today with the grace of God Qadian has spread further still and beautiful buildings are being built there both private homes and Jama’at buildings as we witness the town of the Promised Messiah (on whom be peace) prosper. There was a time when an opposing Hindu whose house was adjacent to Masjid Aqsa used to quarrel and say that he was disturbed by children’s noise and too many people gathered there. With the extension of the mosque what was once his house is now part of the mosque. Hazrat Musleh Maud (may Allah be pleased with him) said he had experienced the time when the Promised Messiah (on whom be peace) was socially boycotted and when people derided and stoned him. 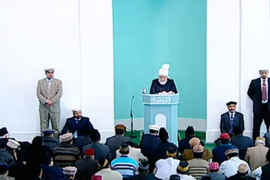 He said 55% of the people sitting in front of him were those who had once opposed but had later joined the Jama’at. He said after Hazrat Khalifatul Masih I (may Allah be pleased with him) a furore was raised in the Jama’at, but what became of those people! They were contemptuous and said they would not be slaves of a mere child. But God put so much awe of the mere child in their hearts that they fled Qadian and did not return. They had boasted that 98% of Jama’at was with them and only 2% was with Khilafat. But now even 2% does not remain with them and more than 98% is with Khilafat. Today in 2014 when the Friday sermon was being delivered the congregation in London was larger than the congregation Hazrat Musleh Maud (may Allah be pleased with him) had addressed. In fact even the congregation in Masjid Fazl, London would be larger than the one addressed by Hazrat Musleh Maud. These are special signs of Divine support and succour. They are signs of the truthfulness of the Promised Messiah (on whom be peace) and of the Divine support that his Khilafat enjoys. May we always keep these matters in view and may they enhance our faith and that of our children!